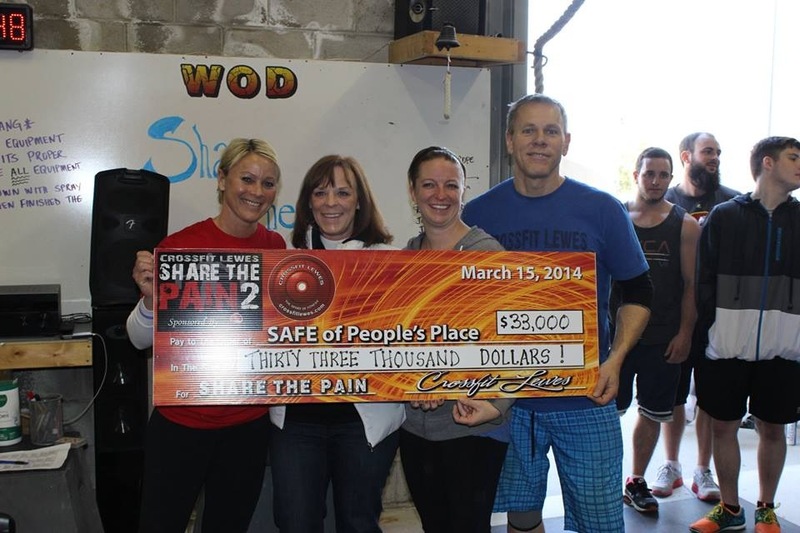 The CrossFit Lewes staff and CFL members recently held their second annual fundraising event, "Share the Pain", to benefit a local charity and chose the SAFE Program as this years beneficiary. The fundraiser was a huge success and raised $33,000.00 for the SAFE program, which has suffered grant funding consistently over the past few years. This year's benefit was held on Saturday, March 15, 2014 at the CrossFit location in Nassau Commons in Lewes, Delaware. Kris Carper, CrossFit Owner, Craig Klasic, CrossFit Trainer, and members participating in the event had been collecting sponsorships and donations for this fundraiser since the beginning of the year. All of their hard work and commitment to raising money to assist domestic violence survivors exceeded their expectations and also enabled them to spread the word about the prevalence of domestic violence in our society. The SAFE Program is thrilled with the amount that was raised and will use this large donation to assist women leaving shelter and in need of security deposits, utility deposits and first months rent. The sponsors of the March 15th event include; Schell Brothers, Atlantic Transportation, George & Lynch, IG Burton, Cape Gazette, Orthopedic Association of Southern Delaware, Big Chill Surf Cantina, LuRong Living, County Bank, Reebok, Therapeutic Massage & Bodywork, Root Gourmet, Dogfish Head, AgVisory, LifeAsRx, Meineke, and the Delaware Coalition Against Domestic Violence.